Located on the Upper East Side of Manhattan, The Promenade Condominium is a residential high-rise luxury condominium with 191 units on 38 floors. It is distinguished by spectacular views and full amenities including a health club and pool. The building offers an outdoor jogging track and a fitness center, wrap-around roof terrace, conference room, party room, children’s playroom, billiard room, bicycle and storage room and a garage – all with controlled access. 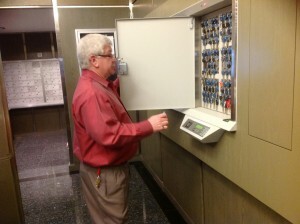 To help keep these building amenities as well as the residents safe and secure, management relies on a key control and management system from Morse Watchmans. Resident manager Dominick Camilleri reports that the KeyWatcher system has been a reliable solution for the past 17 years at the Promenade and not once have they had a problem with lost keys or unmanaged access. When it was decided to update the key control system, a detailed technical evaluation of the new KeyWatcher® Illuminated system as well as competitive product was completed and, according to Mr. Camilleri, the Morse Watchmans system was found to be superior. The new KeyWatcher Illuminated system is designed to improve accounting and tracking, with many convenient features that make it easier to control keys for a large residential property. Each individual key is secured to a SmartKey® locking mechanism with built-in memory chip; data from the chip is stored when a key is removed or inserted into a key slot. 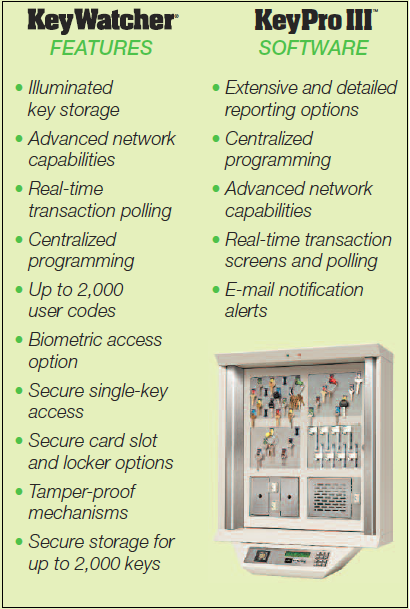 A random key return feature allows users to return keys to any open location within the cabinet and the illuminated key slots simplify the identification and location of the requested key. In addition, the system can send priority email alerts to security managers to inform them of overdue keys or who last accessed a missing key. The new KeyWatcher Illuminated was installed with the complementary KeyPro® software which enables Mr.Camilleri to monitor activity from any desktop connected to the network. He can also trace key movements by time, date and user code, view and print reports and create an audit trail of the time and date of every key accessed by a user for a given time parameter. The automated record keeping software can also help to reduce the number of man hours spent searching for keys or following up on incidents. Whether it’s a high-rise luxury condo or an apartment complex, Morse Watchmans’ key control systems provide tenants and property management with improved security measures, increased convenience and time saving procedures.